3 September 2010, at 9:21a.m. AUSTRALIA - School students in South Australia were encouraged to consider a career in poultry after taking part in another successful Poultry in Schools competition during term two. The latest edition of eChook from Poultry CRC reports that 23 class entries involving 150 students from twelve schools across the state in both junior and senior competitions were received by the South Australian Research and Development Institute's (SARDI) Belinda Rodda, who organised the competition with help from the SA branch of the World's Poultry Science Association (WPSA), Primary Industries and Resources SA (PIRSA), the University of Adelaide and the Poultry CRC. Ingham's Enterprises, Baiada Poultry, Gourmet Poultry and the SA Farmers' Federation joined the CRC in supporting the Careers and Presentation Day at the University of Adelaide's Roseworthy campus. The day was the culmination of the competition designed to spark children's interest in research, farming and other aspects of the industry. "We aimed to educate students about the industry and its career options, and debunk common myths associated with the industry," said Belinda. Children were asked to put together and demonstrate a presentation of poultry words from A to Z. Trinity College won the junior category, with Tintinara Area School and Balaklava High second and third, respectively. Burra Community School picked up first and third in the senior category, with Trinity College second. 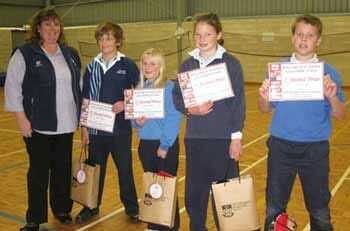 Encouragement awards were given to Trinity College, Coomandook Area School and Kapunda High. PIRSA's Manager of Livestock Industry Development, Simon Gierke, said: "SA's poultry industry is a significant employer in SA and is undergoing significant expansion, providing a range of exciting career opportunities. "It's important that school children from across the state are given the opportunity to learn how the industry operates from the ground up." The Queensland Poultry in Schools Competition is due to wrap up at the end of the current term, with Queensland Primary Industries' Poultry Extension Officer, Tanya Nagle, putting in a tremendous effort to ensure the competition continues to capture the imagination of Australia's school kids and give them insights into our industry. Ms Nagle said: "This year, we have a record 36 schools competing, including three in NSW." Schools throughout Queensland are represented, from Gordonvale and Atherton in the north, Chinchilla and Goondiwindi in the west, down to Southport. The competition will wrap up with the presentation of awards and the traditional chicken BBQ at Redlands Research Station on the 22nd October." The Poultry CRC has been sponsoring the Poultry in Schools Competition since 2008 across South Australia, Queensland and New South Wales. We'd like to thank all those involved in this year's competition, especially all the students, teachers and Belinda Rodda, Sandy Wyatt and Tanya Nagle. Students from Tintinara Area School with SARDI's Belinda Rodda displaying their prizes and certificates from the 2010 WPSA SA Poultry in Schools competition.